The most useful method for building dynamic SQL is to create a stored procedure which accepts parameters. This part of the series explains how to create some basic stored procedures to generate and execute dynamic SQL statements. For our first example we'll create a stored procedure which will allow a user to pass in the name of any table via a parameter and which will return the first ten records from that table. You could also create the same procedure using the sp_executesql stored procedure. Each call to the stored procedure selects the first ten records from the specified table. We can extend the above example by adding a second parameter which allows users to specify how many records they want to display. Once the procedure has been created you can call it and specify how many records you want from whichever table. Each call to the stored procedure returns a different number of records from a different table. There are three films whose names are exactly equal to the text passed into the stored procedure. Any film whose name contains the word King appears in the results. 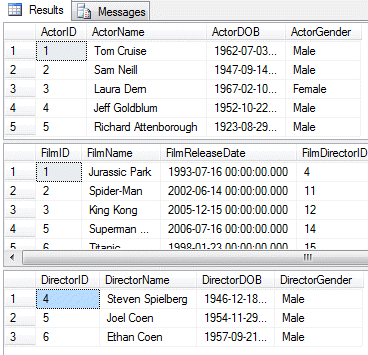 It's not actually necessary to use dynamic SQL to create flexible criteria in a query. You can use basic stored procedure parameters to achieve the same result. We've already mentioned that using the sp_executesql stored procedure can make your dynamic SQL queries faster because they can reuse a cached query plan whereas the simple EXEC statement can't. Another major difference between the two methods is that sp_executesql has extra optional parameters which allow you to set the criteria of a dynamic SQL query. In the code above the first argument contains the SQL statement that we are executing as a unicode string and includes a reference to the parameter called @Length. The second argument contains the definition of the @Length parameter as another unicode string. The final argument sets the value of the parameter that we have defined. Executing the above code will show all of the films whose running times are 120 minutes. Again, the first argument defines the complete SQL statement and the second argument defines the parameters that are referenced within the SQL statement. The subsequent arguments are then used to set the values of parameters that have been defined. Now that you've seen several ways to use dynamic SQL it's time to point out one of the hidden dangers. Read the next part of this series to learn about the dreaded SQL injection attack.